"We must keep fighting, that's what we're here for"
Former vice president of the State Audit Office and current member of the National Bank’s Supervisory Board László Nyikos has just signed his statement of support for the European Citizens’ Initiative for a Wage Union. In his interview for Alfahír.hu, he explained why. “The concept is good, although it will be difficult to realize, no doubt. In the German-Christian world, work is the key characteristic feature and foundation of a human being. You must work. If you must work, why shouldn’t all honest workers be given the pay they earned with their hard work? So, if their performance is equal, why shouldn’t they be given equal pay?” Mr Nyikos responded to our question. Explaining that the practical application will be difficult and obviously require many compromises, he asserted that achieving the widest possible social support was essential. If there is substantial public support for the project, it will be time for the relevant professionals to do their part. “Just think about trade union movements, especially because the wage union concept is a bit like a trade union agenda: how are collective wage agreements achieved in Germany? The representatives of employers and employees sit down at a table and throw arguments at each other. Eventually, they make a compromise,” he said. “I believe the concept is legitimate and worthy of support. We must keep fighting, that’s what we’re here for. It’s not realistic to say that the wage union would be realized overnight. 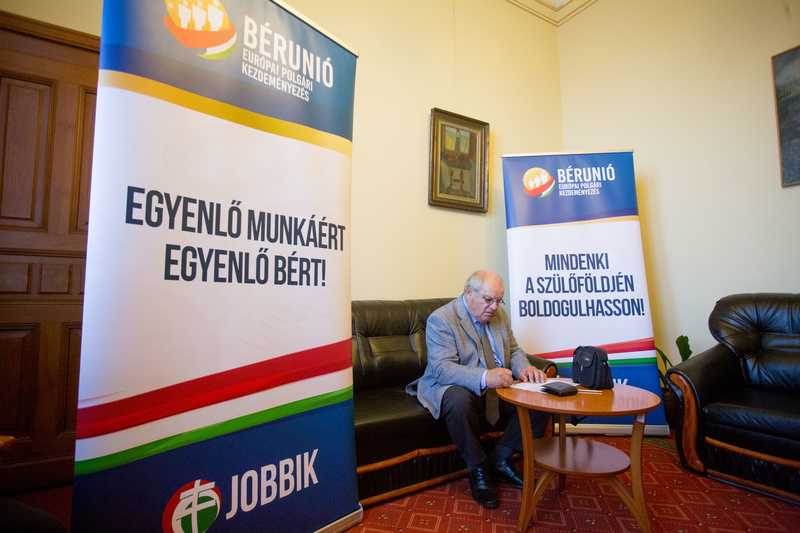 Spreading such allegations is nothing but the usual demagogy,” Mr Nyikos reacted to our reference to the government’s criticism that the wage union was infeasible because Jobbik wanted to implement it immediately. In other words, the government can now set the National Tax and Customs Administration (NTCA) on Jobbik. “That money can only be collected from the party if there’s a final court ruling on the matter, and that’s still far away. As to what this amendment was inspired by, I have no doubts,” Mr Nyikos reacted. He pointed out that the ÁSZ had never been subjected to such a political attack before. To sign the Wage Union initiative, click here!